Here you will find out what most folks do not know about guitar strings and bass strings. You have just found one of the web's largest resource about guitar strings and bass strings. Professor String is where the well strung come and hang out! The things guitar string companies do not tell about their product? Secrets other guitarists and bassists do not know about strings? Untold tricks on how to make your guitar or bass play easier? How to get MAJOR tone improvements with some secrets specific to guitar strings and bass strings? 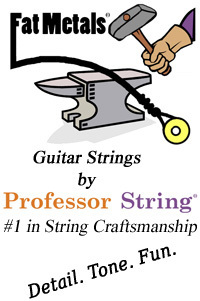 FACT: Most guitar instructors do not teach students anything about selecting strings. Whether you are a class clown of death metal, or a doctorate of jazz improvisation...you will find facts and articles by Professor String to help you get to the next level. In fact, hundreds of guitarists and bassists have asked us about creating a budget minded book on the subject. They felt magazine reviews were biased, and string advertisements were full of crap. As a result, Professor String recently published the first online ebook about guitar strings and bass strings. Stop limiting yourself...if you want to know about the things guitar string companies do not want made public, then...check this out. When talking about the unwound (plain) steel strings that are typically smaller than twenty gauge diameter there is a popular opinion amongst guitarists. Many claim they cannot hear a difference in sound between these strings brand-to-brand... more. 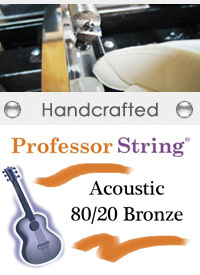 There has been an overwhelming response about Professor String's String Lab. For those of you new to this site, the String Lab section contains information most guitar string companies do not want made public. We will continue to make it available for everyone on a shoe string guitar string budget. We have released previously written articles focused on guitar strings and bass strings. In addition, you will surely find information about guitar and bass strings that has never been published before. We have been hard at work in the lab to get YOU the latest scoop on guitar string research. Some of the topics we have written about include: Guitar string marketing, winding, pitfalls of buying certain brands and much much more. Check out the archives. Professor String gives you a glimpse of how REAL handcrafted strings are made.